Im sorry you had a bad experience because I find it good but the BREADED VEGAN SHRIMP is AWESOME. Try using spices in this.. chop some onions and add garlic and butter and stir fry it in olive oil..sometimes you gotta go out of the box. For the breaded shrimp you just put it in the oven at 425 till crispy brown and it's a wrap sweetie. cocktail sauce and tarter sauce sets it off. 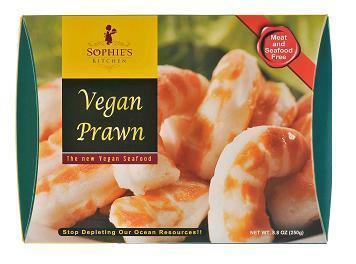 You REALLY must let Sophie's products thaw as the product states or yes, they will come out terrible. Like real seafood, try, you know, seasoning it. A little panko breading, a squeeze of lemon, etc. goes a long way. I had the same experience, took one bite and tossed the remainder straight into the trash. Since shrimp is one of the few things I miss since going vegan, I'd rather do without than settle for this. LOL how bad is this product? IT KILLED OFF THIS BLOG!!!! lol you win the internet for the day! LOL so bad it killed the blog. The flavor was "plastic mixed with nail polish and sadness"...lol this was funny, but now I'm skeptical on trying this. We tried this in 2014 and we disagree with your assessment as to taste and texture. To us, both the taste and texture reminded us of a human finger. Ironically, we DID swallow and had a couple of pieces each! We will never, ever buy that product again. It may be "new and improved" by now. However, the nightmares linger... Thanks for your insight!! if you think the smell and taste is bad, wait until you poop this out!!! UGHHHHHHHHH! These are TERRIBLE in the microwave.